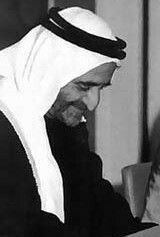 Photo: Sheikh Rashid bin Saeed Al Maktoum was the ruler of Dubai from 1958 until his death in 1990, and is credited with transforming Dubai from a small cluster of settlements to a modern port city and commercial hub. His famous line, “My grandfather rode a camel, my father rode a camel, I drive a Mercedes, my son drives a Land Rover, his son will drive a Land Rover, but his son will ride a camel.” reflected his concern that Dubai’s oil, which was discovered in 1966 and shortly after began production, would run out within a generation. He was a driving force behind a number of major infrastructure projects to promote Dubai as a regional hub for trade to help the economy survive the end of oil production. Photo by Dubai Government Photographer accessed on Wikimedia Commons. Dubai Arabs represent a combination of descendants from familial clans who inhabited the land, and those who relocated from other areas to work in the bustling economy that Dubai enjoys today as part of the nation known as the United Arab Emirates. Dubai Arabs are an autosomal DNA population name within the metapopulation category of Arab and megapopulation category of Middle Eastern. There are two data sets that have been incorporated into DNA Consultants’ method. The Arab – Dubai population data represent autosomal DNA samples from 200 unrelated UAE locals of Dubai. Samples were obtained by the Dubai Police GHQ, by the Federal Bureau of Investigation (FBI) Laboratory in Washington, D.C., and by the Forensic Science Unit of Strathclyde University in the United Kingdom. The Dubai population data represent autosomal DNA samples from 224 Arab individuals living in Dubai. Samples were obtained by the Dubai Police Forensic Administration in Dubai, by the Forensic Science Unit of Strathclyde University in the United Kingdom, and by the Federal Bureau of Investigation (FBI) Laboratory in Quantico, Va. Source publication: Allele frequency distributions and other population genetic parameters for 13 STR loci in a UAE local population from Dubai, ICS (2003) 249-258. STR population diversity in nine eithic populations living in Dubai, FSI 152 (2005) 267-279.